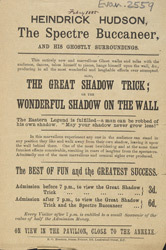 This is an advertisement for Heinrick Huson, ‘The Spectre Buccaneer’, an illusionist appearing in the Pavilion, in London. Although little is known about this performer this kind of entertainment was popular in the 19th century. As technology improved and interest in science grew theatre acts began to be built around scientific tricks or illusions. Ghosts and shadows could be recreated very easily using concealed mirrors and lights. Tricks likes these would have looked very spectacular to the audiences.